inscription: "Linocut by Carlos Cortez, 1993" printed below bottom right corner of graphic. "Poster design by HelveticaJones: garland kirkpatrick," a recycling symbol, and a union label for Allied Printing, Inkworks printed vertically at bottom left. A log with hour horizontal lines and "c /s / p / g" printed at bottom center. Funders listed in small print at bottom right. Black and white poster contains a reproduction of a print on the top three-quarters of the page. The image contains two prominent portraits of a man and a woman at center with additional smaller faces visible behind them at right and left. An eagle symbol for the United Farm Workers of America appears above the group of people in the background. "Viva La Huelga!" appears along the bottom of the image. 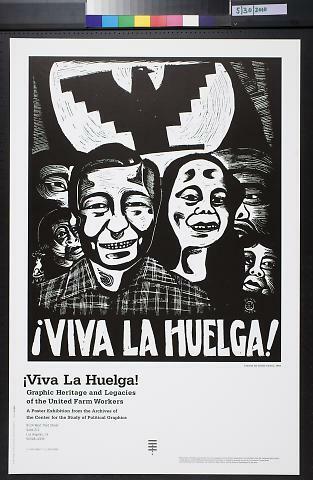 Text at bottom left reads "Viva La Huelga! / Graphic Heritage and Legacies / of the United Farm Workers / A Poster Exhibition from the Archives of / the Center for the Study of Political Graphics." An address in Los Angeles and contact information is printed just below in smaller font.